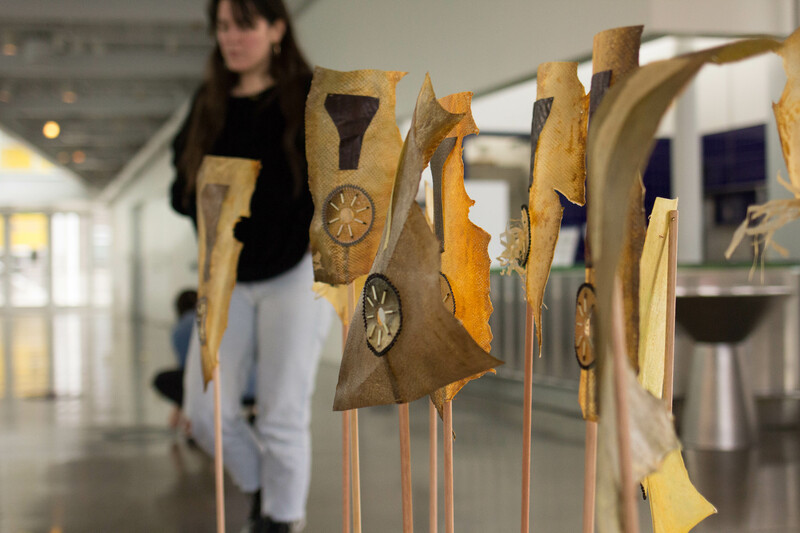 Every year brings the creative process of local artists to the Olympic Sculpture Park through our artist-in-residence program, Art Encounters. 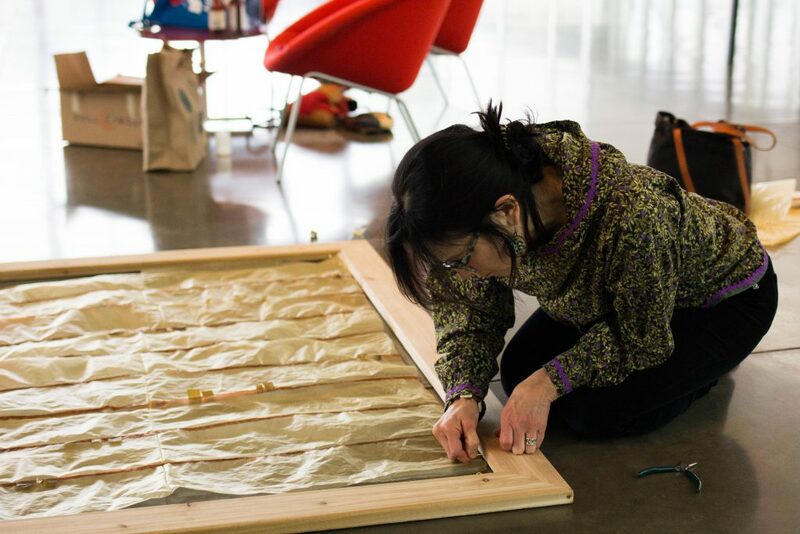 This year Christine Babic (Chugach Alutiiq) is working away on SKIN SEWERS at the PACCAR Pavilion. 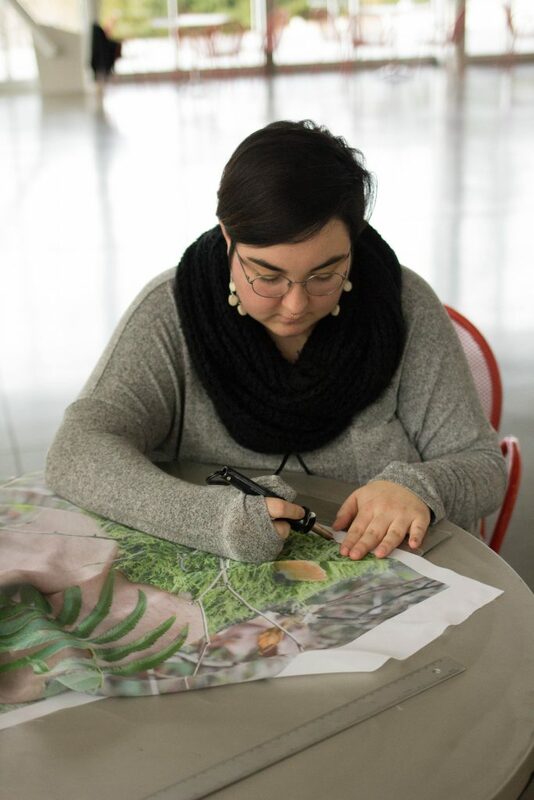 Babic—in collaboration with her mother, artist Mary Babic (Chugach Alutiiq), and Alex Britt (Nansemond, White)—is combining performance and installation to create a site-specific experience that explores the gap between contemporary and traditional Indigenous works. 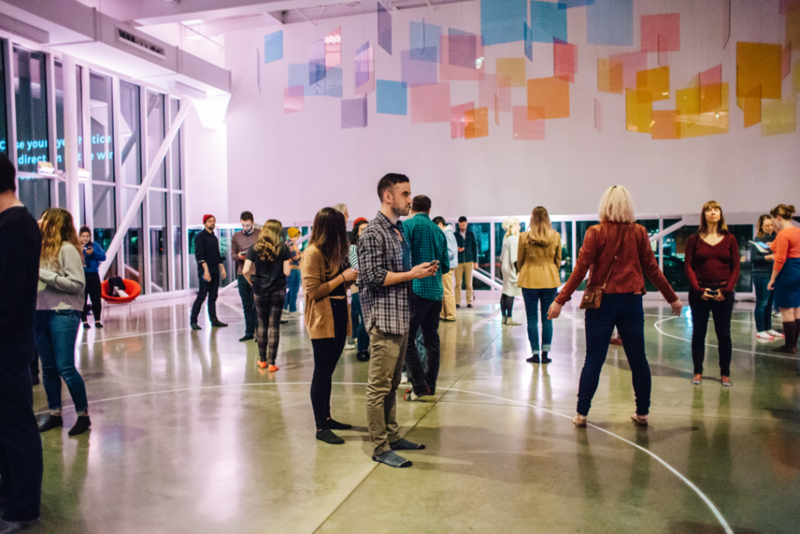 Art Encounters are a chance to learn about the practice of making art while participating in experiences that respond to the Olympic Sculpture Park and the Seattle region. This year you can get involved by dropping into one or both of the Art Encounters on January 25 and February 22, from 7–9 pm. SAM: I love this description of this as an intestinal window into a shared history. I was wondering if you could elaborate a little bit upon on the connection to land, skin, and history in Skin Sewers. Christine Babic: Since this residency is at the Olympic Sculpture Park, we wanted to talk about land and what land means for Indigenous people. Through SKIN SEWERS, we’re trying to get a sense of generational gaps and what the spectrum of generations think of land and its meaning. For both my mom and I, who are from Alaska, we’ve talked about subsistence as being the first thing that comes to mind when we think of land—the resources and gifts of the land. Mary Babic: I was raised in Seattle. I really did not know what Alutiiq meant. I knew I was Alutiiq and I knew I was German. When I moved to Alaska in 1980 I realized I was immersed in Chugach Alutiiq culture. So, I wanted to learn everything I could about my background. I started sewing woods, firs, leathers, and started beading. Friends in the area shared a lot about utilizing the resources we had and living off the land. Not only would you use a seal for its meat (which is very high in iron), but you would also use every part of it. You wouldn’t waste anything. You were always grateful. You would always thank the animal for giving itself to you. That was one thing I learned right away about subsistence. So, I started sewing with the fur. I also learned how to clean the intestine and to blow it out and make things out of it. Christine: It’s an interesting material because it’s a waterproof material, and it’s semi-opaque. And it has this simultaneous fragility and strength to it. You get it wet to sew with it and then it dries. It can be used as rain jackets. Seal intestine was also used for death masks. It was a kind of protection—a spiritual protection. Not only from the rain and weather but this spiritual protection that comes with using these materials. So, there’s a lot of dualities when using these materials. For us, it’s not only an experiment in Indigenous materials but also this spiritual connection to our culture. Doing these things that your ancestors did—these are Indigenous materials and we are Indigenous people. Only Indigenous people can source seal. They’re protected under the marine mammal protection. The materials used in SKIN SEWERS are synthetics, but we’re going off of tradition and what our ancestors used. When people are displaced from their land, there’s no access to the materials that we’ve always used. Practicing culture and making artwork is part of cultural evolution and is important to us as Native people—SKIN SEWERS is not an answer, this a conversation. What kind of materials will be involved in this performance? Christine: For this, we’re using a synthetic intestine which is collagen, pig intestines, and fish skin. So, inner skins and outer skins. Seal intestines is much harder to get. Something I’m addressing is the evolution of Indigenous material and how we use these things in place of seal gut. In my grandmother’s generation, there was a lot of Americanizing going on so she never wanted to be a Native. She wanted to be as assimilated as possible because there was so much racism happening. When my mother moved back to Alaska she was able to relearn our culture and reclaim these things and identities as Native. My mom raised me as a Native person so those ideas are what I’m referencing. I can carry my Native-ness with pride but there is a gap culturally for us, generationally, because my grandmother did not have that option. Through these materials, there’s a lot of acknowledgment happening. You’ve mentioned learning traditional sewing techniques from your mom. Have you two collaborated creatively before? What does your collaboration looks like? Christine: Always. In every show, my mom helped. This is probably our first official collaboration. My mom is inspired by tradition, so she’s really obsessed with researching how our ancestors used to do things. I really like performance art and contemporary art. Bringing parts of what my mother taught me into a contemporary context and working together allows me to make performances out of things that you may not necessarily think are performances, like sewing. This lets us look at them in a different lens—that’s interesting for me. Mary: You definitely take me out of my comfort zone. I do tend to be more traditional in my artwork and I have been working on a curriculum for Chugachmiut Heritage Preservation that teaches about traditional artwork and how to make clothing. I’m working on that project right now. Working a little more contemporary with the material has definitely opened my eyes. The fish skin that we have in the show, we made a non-traditional and traditional tan. We’ve used brains from the deer and some of that is in the window that we have on display. We also did a non-traditional tent which was using glycerin and rubbing alcohol and that I have a video on that I hope to show during the presentation as well. Have you collaborated with Alex Britt before? Christine: No, but I really am a fan of their work. They’re very image-based and a photographer. I always liked how they explained their relationship to the body and land. Bringing in different Indigenous perspectives is important to SKIN SEWERS. Obviously, there is such a wide spectrum. Alex’s photos will be a part of the installation. So, I think it will just kind of show the distances and the different ways we think about land and Native perspectives. When people come to your Art Encounter, what should they expect to experience? Christine: This is an active installation, where people can move freely about and get close to the materials and watch how we work with the materials. You’ll get a sense of how our ancestors used and talked about these. We’ll also have texts about the duality of materials and how we want to continue to use them and bring these materials and traditions wherever we go and think about them as they evolve. We’re going to have a demonstration to inflate the pig intestine. This is similar to the way that ancestors used seal intestines—blowing them up, drying, and cutting them. The labor that goes into using them, how much time and care goes into the work—the performance parts of SKIN SEWERS are an act of care and respect for the material, the land, and our tradition. The process is valuable and beautiful, using these materials involves being meticulous, careful, and loving. We come from people who are sewers, who sew skins. SKIN SEWERS, as a project, is really to highlight how important the action is and not just the finished object. I wanted to show other people the performance through the physical actions and what that looks like. For the third year of our winter Olympic Sculpture Park artist residency, we changed things up a bit. Unlike the last two years, this year’s artist was not selected through an open call, but selected in collaboration with yəhaw̓, an exhibition celebrating the depth and diversity of Indigenous art made in the Pacific Northwest. Curated by Tracy Rector, Asia Tail, and Satpreet Kahlon, yəhaw̓ opens at King Street Station March 23, 2019. You can see more of Christine Babic’s work when it opens! We’ll see you there. “We look to a blue dot on our phones to locate ourselves,” Tia Kramer points out. 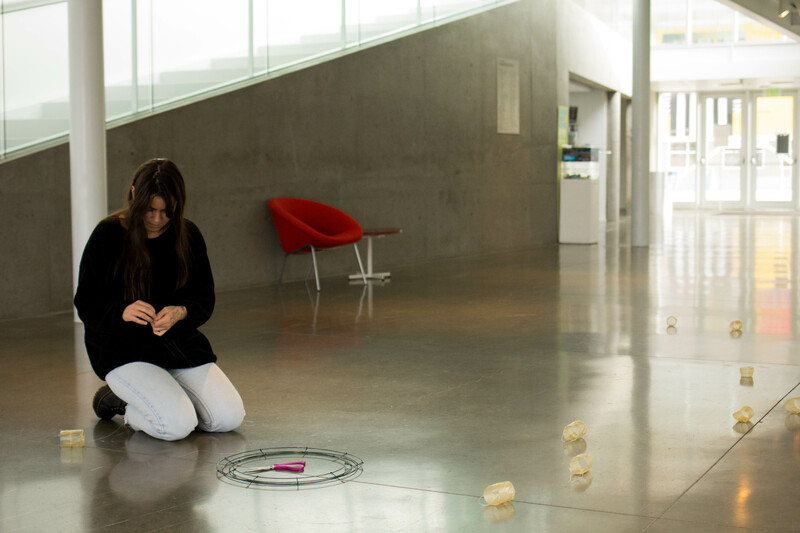 “Orbiting Together offers a new way engage with unseen objects that make that technology possible. 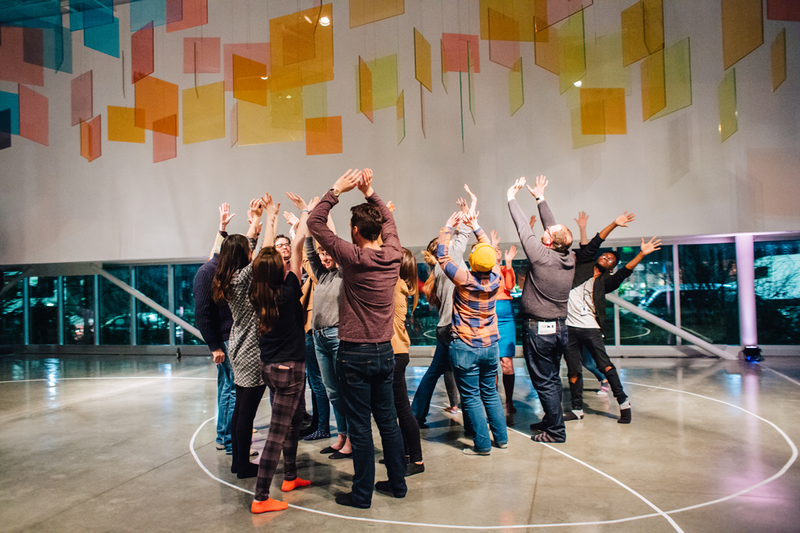 Through text messages we instruct participants to poetically enact gestures that respond to the function of the satellites orbiting overhead.” Orbing Together is the participatory experience of the current Olympic Sculpture Park artists in residence, Tia Kramer, Eric Olson, and Tamin Totzke. 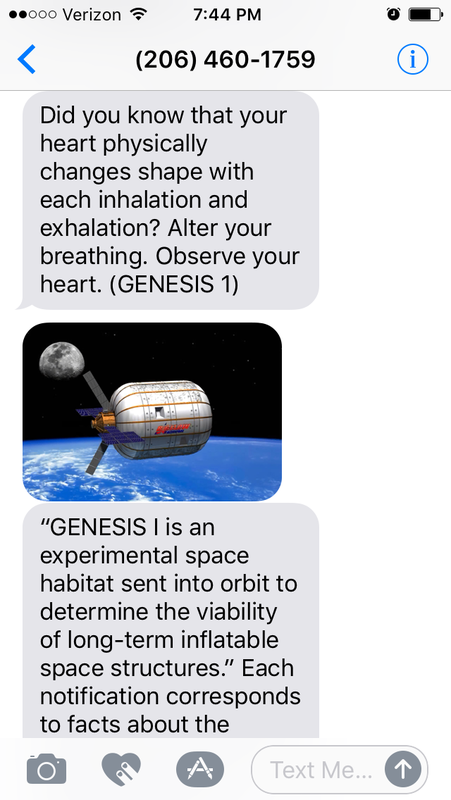 When you opt in to Orbiting Together you get texted instructions, or scores, on how to orient yourself to the space around you once or twice a day, wherever you are, at the same time as anyone else signed up, according to satellite movement over the park. The residency culminates in a final Art Encounter, a participatory experience and performance, at the Olympic Sculpture Park, Friday, February 23. The functions and properties of the satellites triggering the text messages inform the scores you receive. Some of the messages are sent along with images and information on the satellite that sends them. When writing the scores, the artists are considering binaries. Both the binaries of computers that direct satellites across the skies above us as well as, “how to hold divergent concepts in your mind and body at the same time,” Kramer says. The three artists in residence bring unique backgrounds to the project. Tamin Totzke, with an MFA in choreography, offers movement practices that inform the scores. 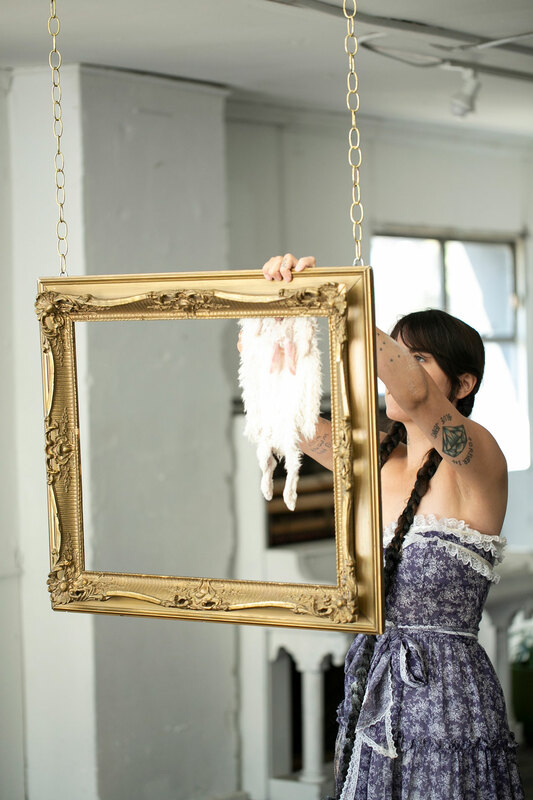 Tia Kramer is a site-specific performance artist, educator, and social choreographer interested in gestures and actions of human connection in the everyday. Eric Olson uses his programming and technical skills to create participatory art practice and social engagement. They all consider the Art Encounter portion of their residency as making the irony of the project clear. “We’re asking people to consider the somatics of our relationship to technology, while using technology to create connection,” Olson points out. Somatics is the making of meaning through intentional movement that allows you to perceive yourself and the world around you. While the project points out how we isolate ourselves from each other and our environments by referring to satellites thousands of miles away to tell us the name of the street we are on, it also uses cell phones and social media to prompt group actions. Because it requires your phone to take part, the balance between documenting and experiencing is also an inherent tension to the project. Orbing Together is at once a chance to re-orient in space outside of your phone, while using your phone to facilitate that orientation. “We’re playing with parody. We’re using an ad agency technology to facilitate personal agency.” Eric Olson says. By creating a database of all the satellites that move over Seattle daily (most pass over multiple times a day), tracking which zip codes they travel through, and using advertising technology that sends text messages, Orbiting Together is bridging space through simultaneity. With people opted in across the world, the Olympic Sculpture Park becomes a location that people the world wide are orienting themselves by, while paying closer attention to their immediate surroundings. 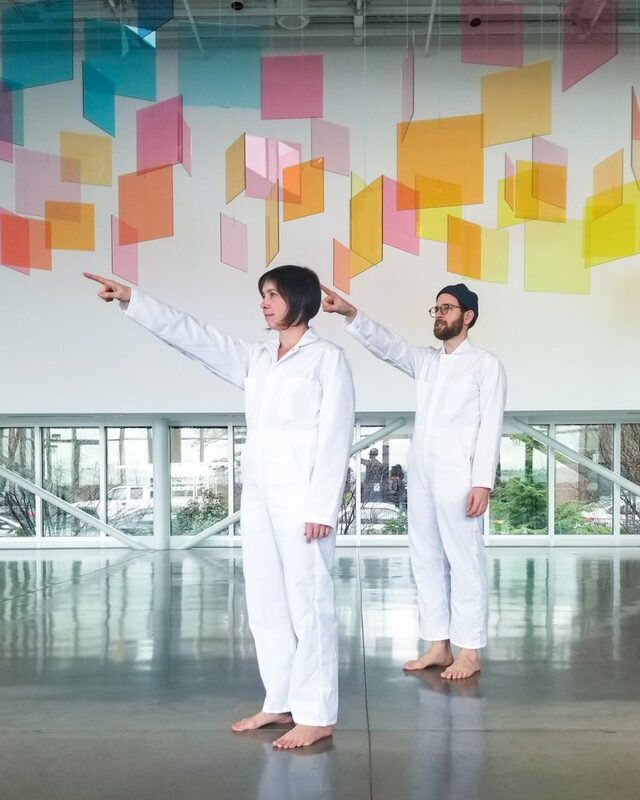 For the final Art Encounter at the Olympic Sculpture Park there will be a blend of visitor participation and performers in attendance. It will not be immediately apparent who is a performer and who is an audience member. The performers will create a complete presentation of the gestures that have been texted throughout the project. There’s still time to take part, text “TOGETHER” to “206 IN 01 SKY.” Also coming up this weekend is a send off celebration and artist tour of the Olympic Sculpture Park, Sunday February 25, 10:30 am–noon. Meet in PACCAR Pavilion to join the artists in residence for a tour of the park with inspired exercises.